It is 1942 and war rages across much of the world. While it hasn’t reached the shores of North America, the spectre of the conflict and its destruction looms over everything and everyone. Entire industries have shifted to building tools and weapons. Even sports and entertainment have been affected. Many professional athletes have taken breaks from their trade to enlist. And even those that hadn’t yet joined found other ways to contribute. 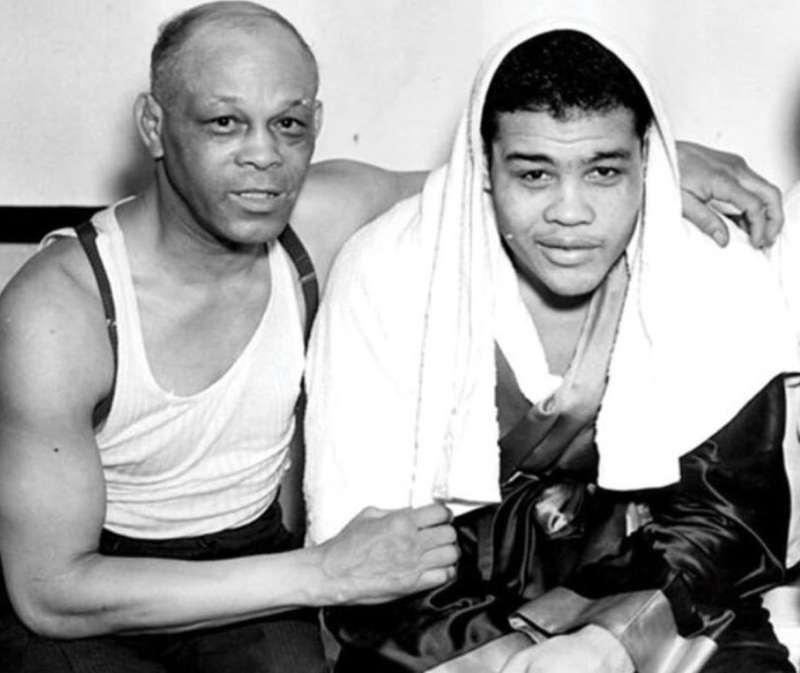 Joe Louis, the heavyweight champion of the world, was one such athlete. Two months prior to this date, he had successfully defended his championship with a first round knockout of Buddy Baer. He donated his entire purse to the war effort and then promptly enlisted in the US Army himself. Before entering basic training, Joe scheduled one more title defense, this time against former foe and top ten contender Abe Simon. A large percentage of the proceeds from the match went to the Army Emergency Relief Fund, including all of Joe’s purse, and about $3,000 from Simon’s. Louis blasts Baer in one round. The match itself was reasonably intriguing. Although many of the champion’s opponents had been derided by boxing pundits as being members of “The Bum of the Month Club,” most were actually legitimate challengers. 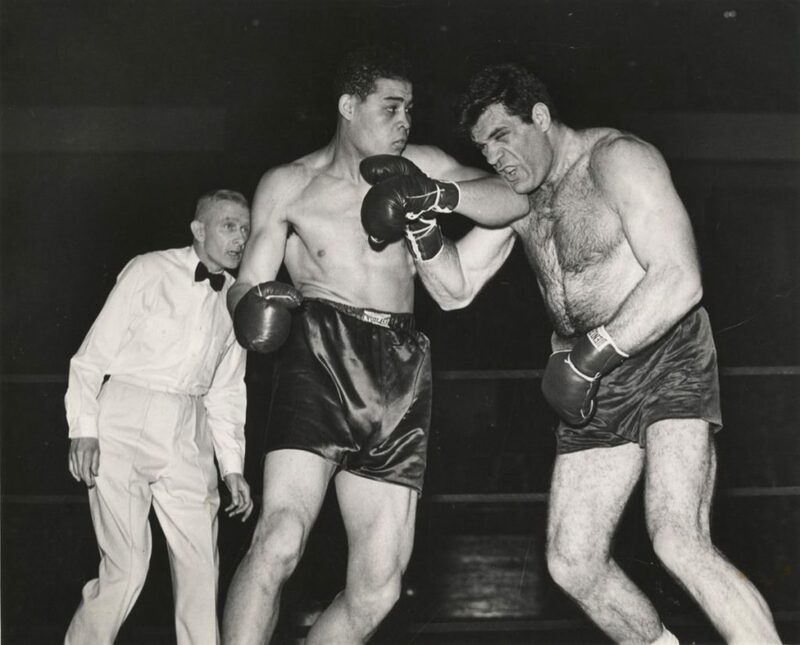 Abe Simon was one such contender, ranked number five at heavyweight by The Ring at the end of 1941. At 6’4” and 255 pounds, Simon was a huge heavyweight for that era, and had the strength and punching power to threaten anyone in the division. 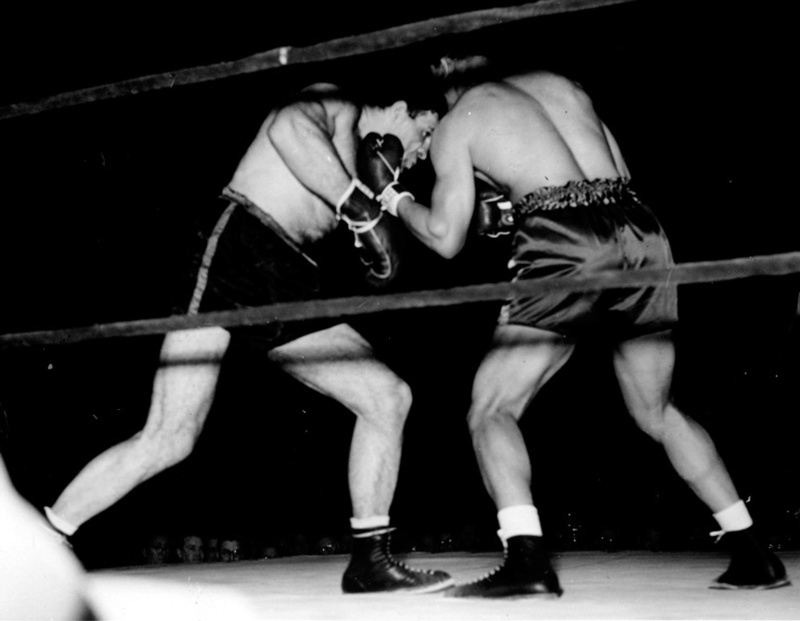 He owned wins over a number of solid fighters including Roscoe Toles, Gunnar Barlund, and a young Jersey Joe Walcott. Most importantly, he had faced off against Louis one year earlier, and gave the champion a truly tough fight, largely holding his own until succumbing to Joe’s power in round thirteen. Louis himself was dealing with personal turbulence behind the scenes. He would be joining the Army soon, and his trainer, the legendary Jack Blackburn, had been hospitalized for pneumonia and for the first time would not be in Joe’s corner. On top of that, the financial troubles that would haunt Louis for the rest of his life began around this time, thanks in part to his generous donations, which the IRS still treated as taxable income. But none of this swayed the oddsmakers who did not think highly of Abe Simon’s chances, as Louis was a 15-to-1 betting favorite. These likely had something to do with Joe’s record in rematches. Every time an opponent gave Louis any sort of serious trouble, he always performed significantly better in the return. 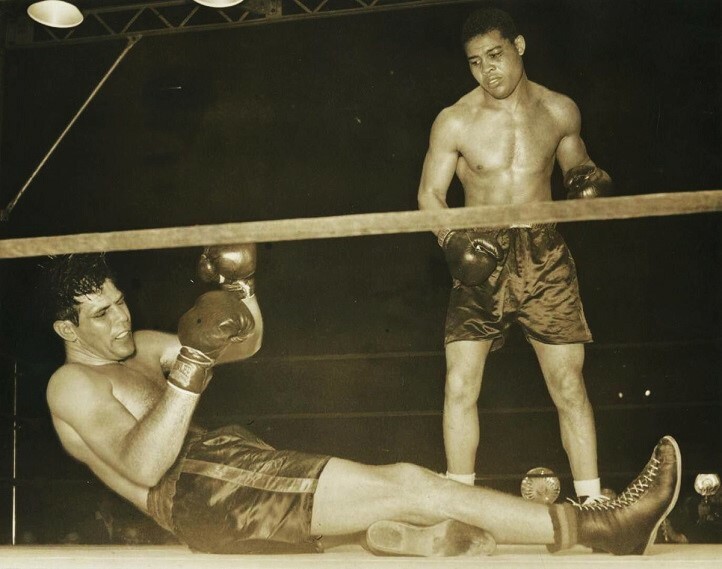 Max Schmeling was obliterated in one round after having earlier scored a massive upset and giving Joe his first loss. Arturo Godoy, Buddy Baer, and later Billy Conn and Jersey Joe Walcott, were all knocked out in rematches after having given Louis stiffer challenges the first time around. Of course it mattered greatly that Simon had already been stopped by Louis, and in fact had been knocked out by the heavy-handed Lem Franklin just five months before the big rematch. 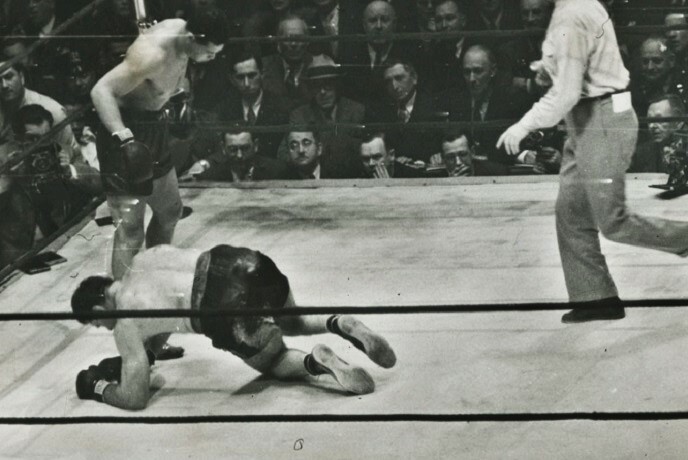 It’s possible his chin may have been dented at this point, and durability was going to be an issue against such a precise and devastating puncher as Joe Louis. Louis and Simon rumble in their first meeting. The oddsmakers appeared prophetic as the opening stanza got underway. The massive Simon seemed tentative, circling with his hands a bit low. The difference in hand speed was clear, but even more important was Joe’s efficient footwork. Simon occasionally snapped a solid jab while retreating, but he failed to consistently maintain any distance, as Louis stalked and shot out brutally accurate combinations. Simon’s best work in the round was done while clinching and mauling, but every time Louis established his preferred range, the combinations rained down on the challenger’s planetoid-sized skull. The first round was a clear win for the champion, which set the stage for an even more one-sided stanza in the second. Simon tried to press forward early, but was dealt a series of powerful right hands for his trouble. As the round progressed, Louis begun mixing in left hooks with his jabs and straight rights; nearly every punch appeared to seriously rock the challenger. Joe couldn’t miss, and Abe looked like he might hit the floor at any moment as he absorbed the relentless onslaught. Late in the second, following a break from a clinch, Louis landed a devastating sequence of blows; three sharp jabs followed by a crushing right that bounced Simon into the corner. As the challenger attempted to circle back toward ring center, Joe landed another grazing right, and then a left-right, followed by two more chopping rights, and Abe collapsed to his knees. Simon bravely rose to his feet almost immediately. At almost the same moment, the bell rang, saving him from further punishment. The next two rounds were successful for the challenger, in that he survived and kept his feet. But the writing was on the wall. Louis knew he could hurt his man anytime he wanted, while Simon’s own considerable power was essentially useless as he was too defensive to bring it into play. Simon down at the end of round five. However, the challenger actually rebounded at the start of the fifth, snapping out jabs and pushing Louis to the ropes. But this success was fleeting. Louis timed a nice right-hand counter over the left, and then landed several more big rights behind it. Soon Louis was the one pushing back the larger foe, and once again throwing each punch with dangerous intentions. Simon spent the rest of the round absorbing punishment, always on shaky legs, but only near its end did a fusillade break through and put him down in a heap in the corner. But once again, Simon was saved by the bell and survived to fight another round. Well, kind of. Just seconds into the sixth, Louis landed a right cross followed by a left hook, and Simon dropped like a rock. 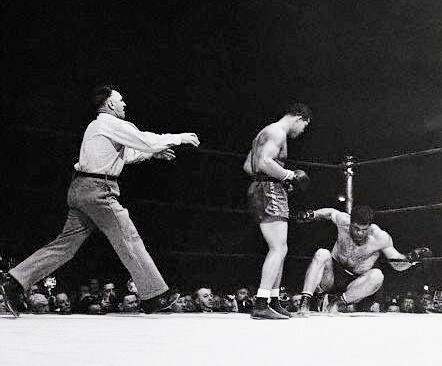 He somehow made it to his feet as referee Eddie Joseph counted “ten,” and that was it. The great Joe Louis had retained his title yet again. 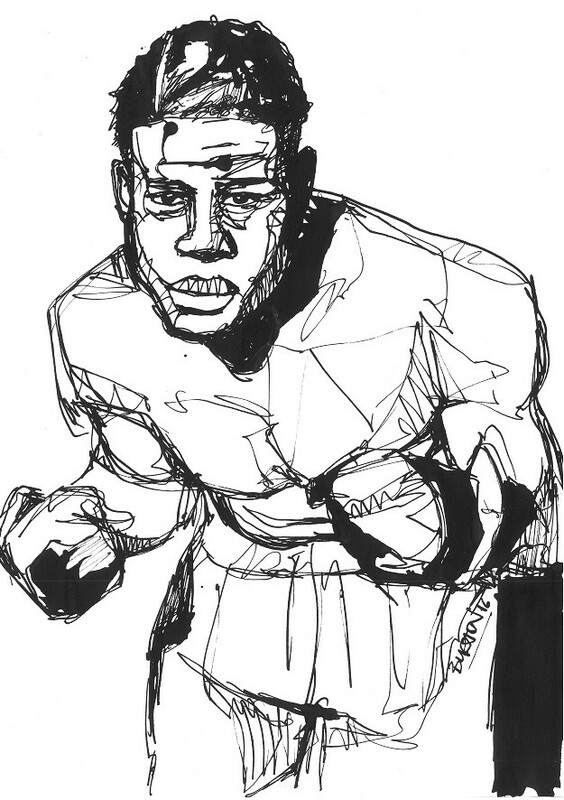 Joe Louis. Ink drawing by Damien Burton. In the months following the fight, Louis would head to basic training, and spent the next few years fighting exhibitions while touring in the Special Services Division of the US Army. He wouldn’t have an “official” fight again for more than four years, but would emerge from the war with his title, if not his finances, still intact. Abe Simon retired after the second Louis bout. He would go on to act in several films and television movies, including On The Waterfront and Requiem for a Heavyweight.